Eric M. Meyers, biblical scholar and archaeologist at Duke University, and Mark A. Chancey, Professor of Religious Studies at Southern Methodist University, worked together to publish a third volume of a series on biblical archaeology. The first two volumes, by Amihai Mazar and Ephraim Stern, covered material up to the Hellenistic period and conquest of Alexander the Great (332 BCE). Meyers and Chancey continue the history of the Levant from the transition of the Persian period to Hellenism to the rule of Constantine. More specifically, Alexander to Constantine focuses on the ways in which Judaism expressed itself through various external pressures, especially archeological currents. Chapter One dovetails off of the end of Ephraims Stern’s volume 2 of Archaeology of the Land of the Bible (Yale University Press, 2001) by providing more recent demographic data for the Persian province of Yehud and Jerusalem, calling for lower population estimates. It also expands upon Stern’s volume by emphasizing Greek influence present even during the Persian period. Chapter Two continues with the conquest of Alexander the Great and its impact within the Levant. Examining archaeological and numismatic evidence, Meyers notes that the Hellenization of the Levant through Alexander, Seleucid, and Ptolemaic rule resulted in Jewish communities who expressed themselves through Hellenistic means, eventually leading to the Maccabean uprising. Chapter Three continues with Roman claim of the Levant. More specifically, Meyers focuses on Herod the Great and how he contributed to the regional archaeology through things like the Temple Mount, Caesarea Maritima, various other cities, and the effect of Herod’s archaeological developments upon commoners. All in all, Herod’s achievements “brought Judea into greater dialogue with the cultural current of the Roman Empire” (82), albeit simultaneously putting the region on a rocky path through notorious behavior. Chapter Four moves to Khirbet Qumran and refines chronological conclusions of the site by Roland de Vaux, reviewing the arguments of De Vaux and Jodi Magness. In short, he concludes that regardless of the specific debates about Kihirbet Qumran, it was sectarian after 100 B.C.E. and reflects a community at one with “complex common Judaism” and also unique. Chapter Five proceeds from the end of the reign of Herod and how the division of the area into four regions destabilized the region. He explores this period through the most important archaeological finds, ranging from numismatic evidence to things like the Pool of Siloam. The evidence, argues Meyers, “provide(s) strong support for reconstructions of early Judaism that emphasize the common elements that bound Jews together, even in the midst of the diversity reflected in ancient literary sources” (138). The destabilization of the region is further explored in Chapter Six, which focuses on major sites that speak of the Great Revolt and Bar Kokhba Rebellion. Rather than detailing the war in it’s complexities through archaeology, Alexander to Constantine focuses “on a few aspects only to get a better sense of its centrality to the history of the Holy Land for Jews and Christians” (141). He includes Galilee, Sepphoris, Yodefat, Gamla, Jerusalem, and Masada for succinct analysis of the archaeology of the rebellions. He then wraps up the chapter by detailing the consequences and results of the revolts, especially the demographic shift to Galilee from Judea in the 1st century. Having established a solid foundation in the previous chapters, Chapters Seven through Nine focus on the emergence of Christianity, early Judaism, and paganism, and demonstrates the unique directions each religion moves towards. Chapter Ten explores how Greco-Roman culture impacted the region, with Sepphoris as a test case. Finally, Chapter Eleven wraps up the volume with a brief entrance into the developments after the reign of Constantine. Alexander to Constantine is by far one of the best works available for historical analysis of major sites written towards a non-professional audience. As part of the Anchor Bible Commentary and Reference Library, Meyers and Chancey write to a broad audience by focusing on the representative data, rather than including every piece of archaeological evidence. These standards prevent the book from becoming too technical or too simple. It is, thereby, readable and valuable for scholars, students, and the public. Additionally, the overall focus, namely how Jews used Hellenism as a vehicle for expression and preservation, is consistently present. Meyers and Chancey make clear the ways in which Jews adjusted to external pressures. Yet there were a few elements which should be refined. First, as a book written for scholars and non-professionals, I was surprised that there was no detailed map of the region. A single, detailed map would contribute to a better understanding of the information and the locations geographically. Second, at moments Meyers speaks of the prescriptions in the Torah (31, 49, 112). To what extent, though, were these prescriptions authoritative? Were they merely normative? The issue of textual authority should be addressed because it significantly affects how 1st century history is reconstructed and perceived. 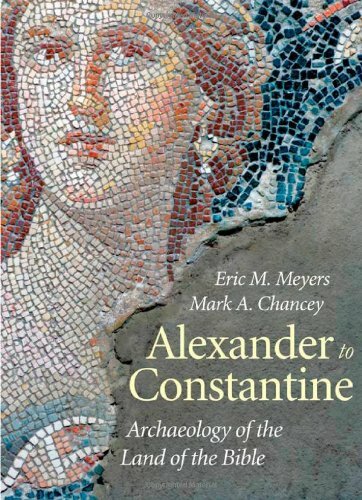 Aside from these minor critiques, Meyers’ and Chancey’s Alexander to Constantine is invaluable to students and non-professionals exploring the history of the “land of the Bible” with a focus on history through the vehicle of archaeology. For New Testament courses, it is an excellent option for alternative, supplementary reading because it moves beyond the text and emphasizes the archaeological records. With such a broad and succinct overview of a field in constant flux, much of the information present may change or develop over the next decade. Given that Alexander to Constantine is already so up-to-date, I hope that there will be future editions expanding upon the information already present. I would like to express my gratitude to Yale University Press for providing me with a review copy in exchange for my honest opinion. Originally posted on The ​Biblical Review by William Brown. Meyers, Eric M. "Alexander to Constantine: Archaeology of the Land of the Bible, Volume III." Ancient History Encyclopedia. Last modified October 30, 2015. https://www.ancient.eu/review/93/. Meyers, Eric M. "Alexander to Constantine: Archaeology of the Land of the Bible, Volume III." Ancient History Encyclopedia. Ancient History Encyclopedia, 30 Oct 2015. Web. 20 Apr 2019.